Mud runs are a great way to get in shape and have fun. Runs are made to challenge you to your utmost in a creative and fun race that often involves teamwork and competition. If you’re planning on running for your first mud run, you have to train in advance. Here are a few tips that you can use to get started. Train Six Weeks In Advance – It is important to start your training well in advance of your actual mud run. While you don’t have to train for months, it is a good idea to start at least 6 weeks in advance. Try training harder than you expect your mud run to be. This allows your body to adjust to the run so that instead of collapsing in exhaustion at the end of the race, you can enjoy the victory. Start off Slow – If you’ve never exercised before or aren’t used to steady or hard exercise, then you might want to start off slow. Depending on your normal level of exercise, you might want to try doing a running walk combination and slowly building up to a full run. By the end of the six weeks, you should be running your course at full speed. Remember that the idea is to warm your body up and to stretch your limits without actually hurting yourself. Treat your body carefully and if you are having too much trouble, try consulting a gym trainer for advice. Run Stairs – Running stairs is a great way to train for a mud run. Stairs build up muscles in the legs, which will help you run through mud and high water. Running through mud is harder than running on flat ground, which is why stairs are the perfect exercise. Do Obstacles – Most mud runs, even those for beginners, have obstacles so you would do well to prepare yourself for them in advance. Try jumping small obstacles at first or climbing over play sets in parks. Adjust your body to mud runs slowly in order to avoid hurting yourself. You can also try jumping empty park benches, hedges and etc. as your body adjusts to the challenge. Get The Right Clothing – It’s important to wear the right clothing for a mud run. 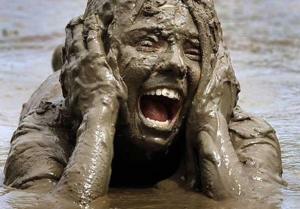 Your clothing will be wet during the mud run which will make it harder to run. You should wear sports clothing that dries quickly so that it holds less mud. Another good idea is to practice running in wet clothing so that you have some idea of how difficult it will be doing the real thing. Remember that a mud run event is a challenge. You should check around to find mud runs in your area and then talk with the sponsors in order to determine which ones are appropriate for beginners and exactly how much training you need in order to be able to complete it successfully. Another great thing to remember is that mud runs are meant to be fun so you should enjoy yourself while you race!